Having	interesting nail art will help you complete your look and make a statement. There are tons of	creative nail designs to choose from these days. But if you want to upgrade your manicure, you have to try the newest cuticle tattoo trend. 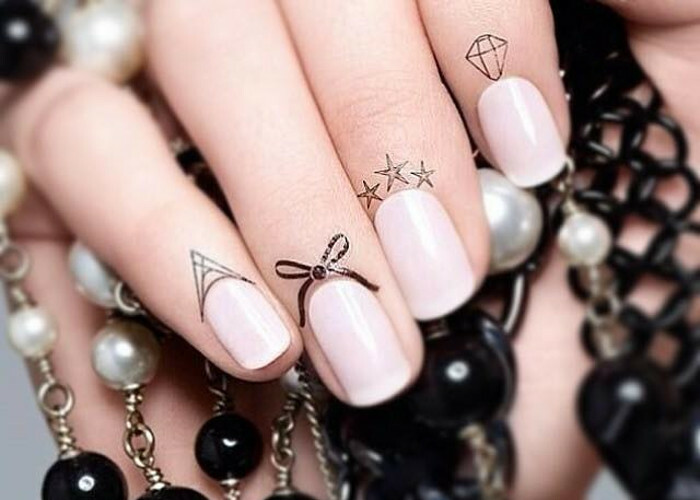 Besides your regular manicure, you can add tiny tattoos on your cuticles to make an even greater impression. The first celebrity who sparked this unusual trend was Rihanna. The singer got tribal-inspired tattoos on her cuticles back in 2013. Two years later, Zoe Kravitz got her band’s name Lolawolf spelled out along her cuticles. The actress got one letter and a dot above it on each finger with an exception of her thumbs. Back then the cuticle tattoos didn’t gain much media attention, but now more people are getting obsessed with this trend. The cuticles are a very sensitive spot and getting a permanent tattoo there might be painful. Besides that, not everybody wants to get a permanent tattoo just because of a temporary trend. Luckily, nail salons started offering temporary cuticle tattoos for trendsetters who want to keep up with the latest nail trends. There are multiple different ways to decorate your fingers. From simple dots to intricate decorations around the nails, the options are endless. You can still add a permanent art to your fingers, but this is just a good option for those who want to try this trend. Another way to elevate your manicure is to buy nail kits that come with temporary cuticle tattoos. You can also use nail art stamps to create the tattoos by yourself. Besides the classic black color, Instagrammers flaunted gorgeous manicures with golden cuticle tattoos. Feel free to use any color you want to decorate your nails. Take a look at these unbelievably cute cuticle tattoos and get ready to upgrade your manicure like never before.